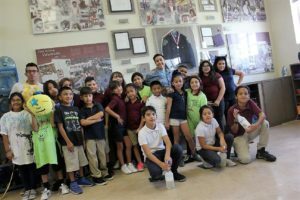 Any chance I get, I LOVE to volunteer my time with the youth at the John Valenzuela Youth Center “JYVC” in South Tucson. 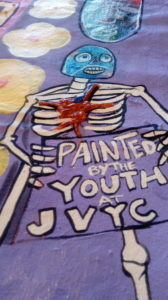 I hosted a 3 day mural painting workshop with the youth surrounding the Dia De Los Muertos theme. The first panel was a traditional view showcasing a sugar skull and papel picado. Second panel depicted an altar and we added a photo of John Valenzuela, the police officer who the center is named by. The third panel was of the All Souls Procession that is celebrated in Tucson. What a wonderful time to share the old and new traditions of Dia De Los Muertos and to spend time with youth in my community.